This story was originally published in the Sierra Club’s Stop Clearcutting California newsletter. Written by Steve Lemig. 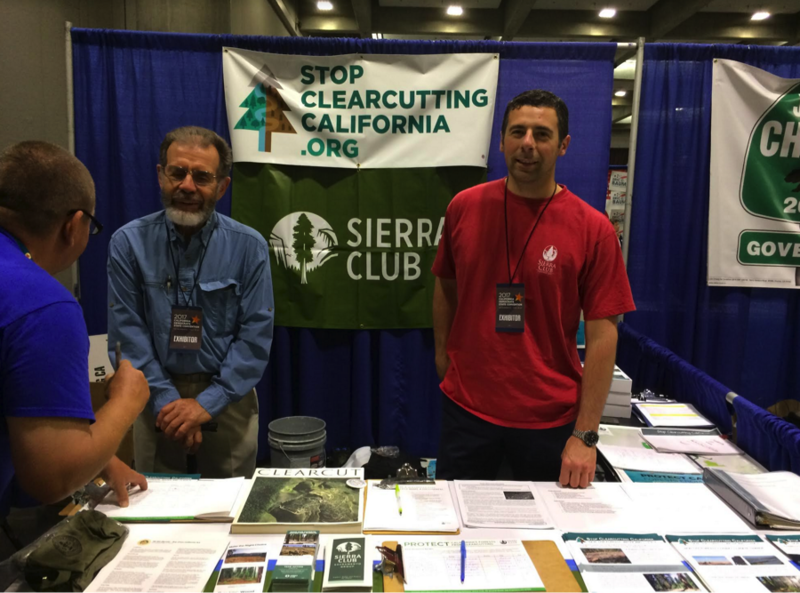 The Stop Clearcutting California Campaign and the Sierra Club had a very successful weekend raising awareness and support at the 2017 California Democratic Convention May 19-21. The annual convention was held in Sacramento at the downtown Convention Center Complex, and drew 3000 elected officials and party activists throughout the state. Speakers at the California Democratic Convention included Democratic Leader Nancy Pelosi, Lieutenant Governor Gavin Newsom, CDP Chair John Burton, US Senator Kamala Harris, DNC Chair Tom Perez, and many more. The convention meets every year to bring the California Democratic party together to help California lead the nation in the fight to protect not only basic human rights, but also how to strengthen the party’s position. And while much of the conversation was focused on how to best target vulnerable Republican seats in the mid-term elections being held later this year, there was also discussion about the importance of protecting California’s natural resources, and ensuring the quality of our air, water, and land for current and future generations. While some party members were unaware that clearcutting is still practiced in California, we found attendees to be immediately supportive of our efforts. Many legislators even expressed interest in taking up our cause, which was very exciting. To further spread the word about Stop Clearcutting California, the convention offered us three opportunities to reach out to delegates, and we took advantage of all of them. First, we rented a booth to give us the chance to speak directly to hundreds of delegates, elected officials and their staff, many of whom said they wanted to do their part to put an end to clearcutting in California. We also distributed factsheets outlining the many drawbacks of clearcutting including the large amount of carbon emissions it produces, the increased sediment and herbicide it sends into rivers and streams, and the resulting loss of animal habitat. We also drove home the point that clearcutting threatens the attractiveness of California forests to tourists, who provide more revenue and jobs than the timber industry. Recent economic studies indicate the outdoor recreation industry brings in 31 times more income than logging our forests and creates 38 times as many jobs. Our Stop Clearcutting California booth was manned by an enthusiastic staff of seven who were a mix of senior members and new members. When traffic to the booth slowed, our volunteers hit the hallways and walkways to engage attendees. As a result, we gathered nearly 300 signatures on the petition asking Governor Brown to ban clearcutting in California. In addition, our booth helped us network with other environmental groups and individuals working on projects with similar missions to the Sierra Club, and enlist 11 potential volunteers. Second, we developed a very attractive bookmark, which was inserted into each delegate’s goodie bag of advertisements and gifts, with the intent to drive several hundred more thought leaders to learn more about clearcutting on our Facebook page and websites. Finally, to further raise awareness our Stop Clearcutting California logo was displayed during on the large electronic billboard in the convention center complex, which broadcasted our website address to the thousands of attendees.